Course Overview: Have you ever dropped something in the water? Are you looking for lost treasure? The Search and Recovery Diver Specialty course will teach you effective ways to find objects underwater and bring them to the surface safely. Prerequisites: Must be at least 12 years old and be an Advanced Open Water Diver, Junior Advanced Open Water Diver or be an Open Water Diver, Junior Open Water Diver and an Underwater Navigator Specialty Diver. Course Activities: You will learn about planning, organization, procedures, techniques, problems and hazards of search and recovery diving, limited-visibility diving and underwater navigation techniques, proper techniques and safety considerations for object location, including the use of various search patterns, lines and reels, and proper techniques and safety considerations for recovery of objects using various lifting devices. You will get to use your new knowledge during the 4 dives done under instructor supervision. Classroom: There is one classroom session. The classroom session will cover the Search and Recovery Diver Specialty Manual, review your knowledge review answers and prepare you for each of the four open water dives. Independent Study: Before you come to class read the Search and Recovery Diver Specialty Manual and complete Knowledge Reviews Part I and Part II. You will need to turn in the knowledge review prior to certification or provide a copy of an Adventure Log signed by an appropriate instructor if you have already done dive one in connection with your Adventure Diver or Advanced Open Water Diver Certification. Recommended: watch the DVD. Open Water Dives: The 4 open water dives are done at an area lake/scuba park or on a dive trip (must be done over a 2 day period). Materials/Equipment Required: The Search & Recovery Diver Specialty Manual. Recommended: The Search & Recovery Diver DVD. Length of Course: If you have read the entire Search & Recovery Specialty Manual, completed the knowledge reviews and watched the entire video prior to coming to class, the classroom session should take approximately 1 hour depending upon class size. Small area search: Search for and recover a small object (no bigger than a baseball - smaller if visibility is good) that has been placed in a pre-determined area (approximately 50 feet by 50 feet) using a circular/rope pattern search. Large area search: Search for and recover an object (not more than 25 pounds negatively buoyant) that has been placed in a predetermined area (approximately 100 feet by 100 feet or other dimensions for the same area of search using a U pattern search. Tie the following knots correctly while underwater: the bowline, two half hitches and a sheet bend. Learn how to safely rig and bring to the surface an object not more than 25 pounds negatively buoyant using an appropriate lifting device. Enter the water and mark off the search area with buoys. 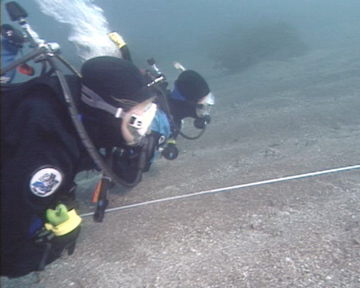 Using the expanding square pattern, search for a submerged object in an area approximately 60 feet by 60 feet or other dimensions for the same area of search. Use an appropriate lifting device to safely rig and bring to the surface an object weighing 25 to 50 pounds. 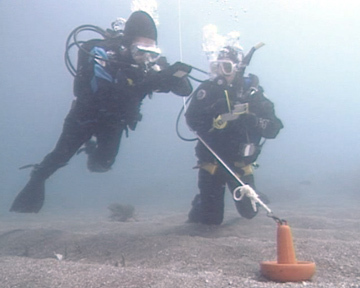 Using the jackstay pattern, search for a submerged object in an area approximately 200 feet by 200 feet, or other dimensions for the same area of search. Use an appropriate lifting device to safely rig and bring to the surface an object weighing 50 to 100 pounds. Organize, plan and conduct a search and recovery dive for a lost item with a dive buddy. 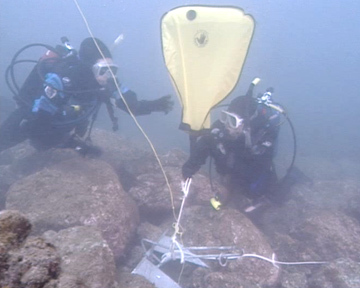 Choose a appropriate search pattern and lifting method based on facts gathered about a lost object prior to a dive. Using an appropriate lifting device to safely rig and bring to the surface a lost item.